A/B Testing- How to Increase Conversions and ROI? A/B testing is one of those techniques which helps to identify the web pages which are helping the most in leading to conversions. This guide will teach you all the basic and advanced methods of A/B Testing. A/B testing is a marketing analysis technique where two or more variations of a web page is tested against one other in order to find out the best performing one. It is also known by the name if split testing. It can be used as a testing platform for determining the success of web pages, email campaigns, advertisement campaigns (like adwords) etc. Areas Where A/B Testing is Used? Testing different versions of mobile apps etc. 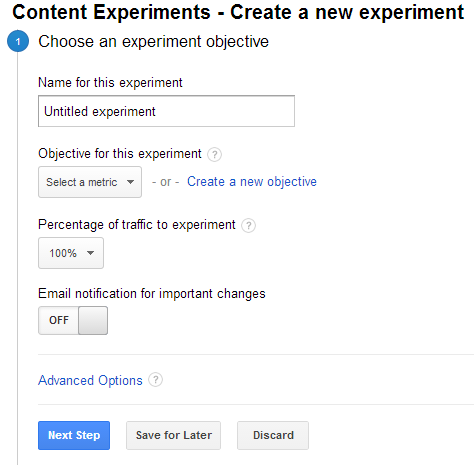 How to Carry Out A/B Testing Content Experiments Using Google Analytics? Step 1: Sign in with your Google Analytics Account. 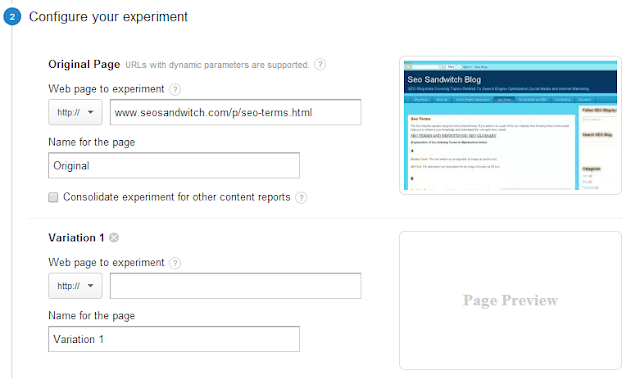 Step 3: Now, enter the URL of the page you want to improve goal conversion and click on start experimenting. Step 4: Enter the details of content experiments. Provide a name for your experiment, select an objective, select the percentage of traffic where you want to experiment and set the email notifications. Step 5: Configure the details and choose all the variation URL's which you want to test against the original URL. Step 6: Insert the experiment code in the original page and make sure the analytics code is inserted into the variation pages. Now, you may start the experiment. Every business wants to increase the return on investment (ROI) and A/B testing is one of the best ways to find out the best combination which helps to get more conversions. Content experiments can be run by any business having a Google Analytics account and properly planned and executed experiments gives excellent results. Is A/B Testing Right for Me? Yes, A/B testing is perfect for your business because it does not allows you to lose something but instead it helps your business to get a winning combination which comes after successful and thorough testing. 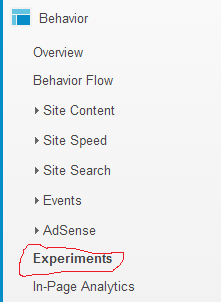 All this comes at a no cost to the company because A/B testing experiments can be run for FREE using Google Analytics. All you need is a little bit of coding knowledge and admin access to install the tracking code. One good example of A/B testing would be to create 2 different versions of product page and see which page gets the most referrals to the checkout page. For this, one new product display page is created which is slightly different from the original one. Texts, images, buy buttons, videos, product descriptions etc are all changed slightly in order to persuade the buyer to click on the "buy now" button. Now, a content experiment is created using Google Analytics and both the references of original URL and variation URL are specified in order to find out the best converting page. The experiment runs for a few days or weeks until a clear winner emerges. This A/B testing experiment is great for identifying the best page which initiates conversions and helps to improve the ROI for the company. 1- It unleashes the human mind as to why people convert to certain pages. 2- It helps to test conversion rates for specific pages based on colors, fonts, catchy headlines, navigation options etc. 3- Split testing is FREE and requires minimal effort. 4- Instead of predicting things, tests can be carried out to identify the best possible combination which provides results. 5- It helps to measure the actual customer behaviour. 6- It helps your business to survive in a competitive environment by quickly providing the best solution for your business. 7- A/B testing is quick and provides results at a faster rate than expected. A great tool for testing the success of your A/B content test experiment is http://getdatadriven.com/ab-significance-test. This tool allows you to calculate the success ratio of Page A compared to Page B. You can compare both your original and duplicate pages here and get the results yourself. There are several tools which you can use to test variations of your main pages. These tools are both free and paid. Google Analytics - The big daddy of tools. Google Analytics is free to use. Just sign up and start your A/B testing today. Wingify - One of the world's easiest A/B testing tool. The core product of Wingify is the visual website optimizer which allows you to create different versions of your website and see which one performs better. Optimizely - Provides an easy experience for creating variations of web page. Optimizely allows editing through a powerful visual editor. Mail Chimp - This is an excellent tool for A/B testing the success of your email campaigns. Mail Chimp allows you to choose the most effective content for your email which provides the best results. Crazy Egg - Test the real users with this awesome tool. Add small piece of scripts and testing them is really easy with Crazy Egg. 51 Secrets You Didn’t Knew About Google!